As a new chicken owner I realized that once my chickens (6 Araucanas) were outside and growing faster than ever I would have to fill their old chicken feeder daily. Which is OK, but I didn't have the time. I found that most commercial feeders at the store cost around $30. I wanted to see if I could build my own for less than that. So I went to Wal-Mart. I bought one five gallon plastic bucket and two lids. I then drilled a series of wholes around the bottom. 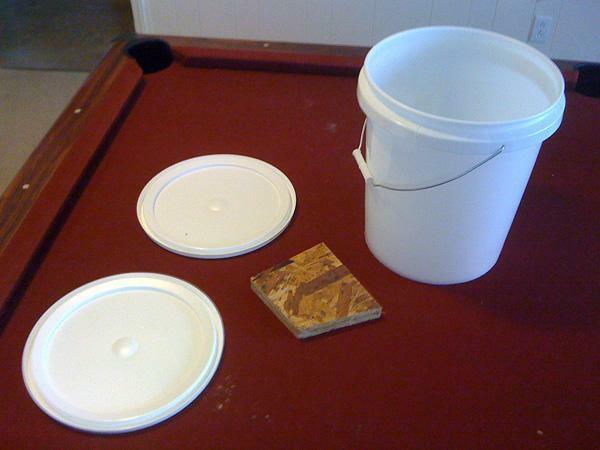 I then placed some spare plywood that I had on the bucket. The layer of wood is about 1" think. 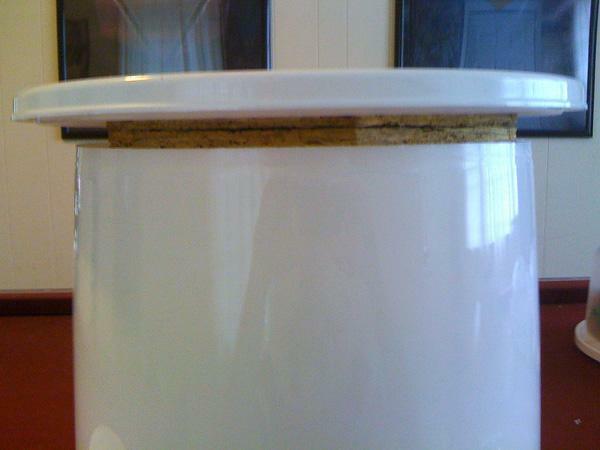 I then screwed the lid to the bottom of the bucket through the plywood. This shows you how the layers look. 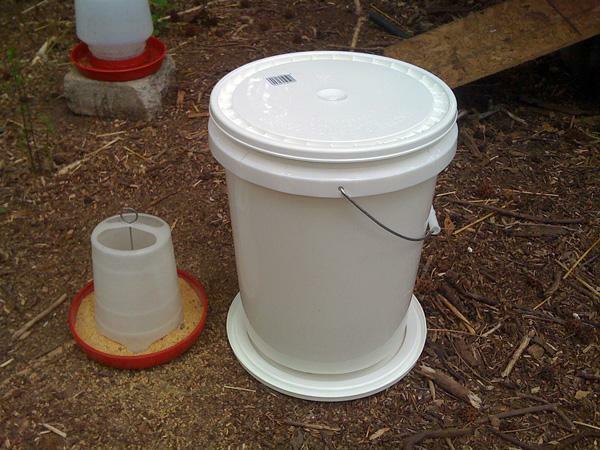 This is the finished "DIY" feeder and the old feeder I had in the brooder box. The waterer in the back is a 1 gallon waterer. 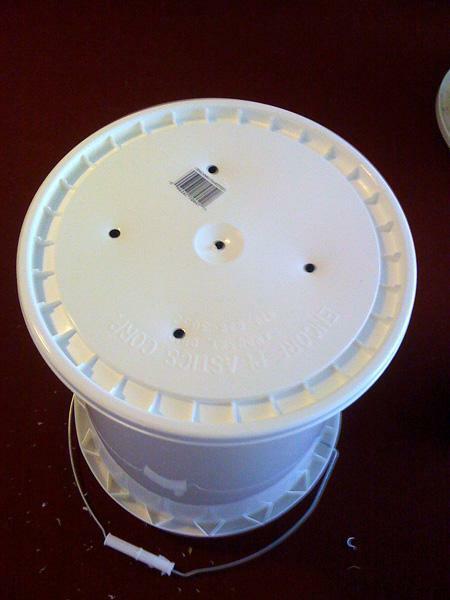 When it's all assembled it holds about 25lbs of chicken feed which lasts my six chickens about three weeks. I do have to come out and shake it occasionally, but I'm out there with them anyway so it's not really a problem. All I had to buy were the two lids and the bucket. I got them from the painting supply section of Wal-Mart. 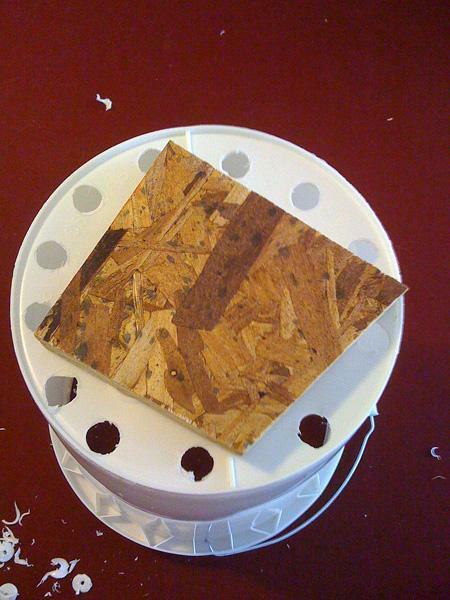 I had the left-over plywood from another house project. The total cost of this project was about $7.50. Easy to follow along with how this feeder was made. Inexpensive too! This is a really good idea. I have a ton of walmart buckets around so I think I'll try this. How do you keep the food from getting wet when it rains? 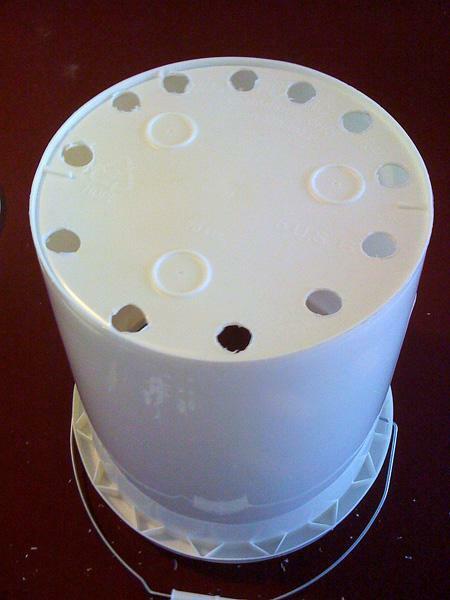 I did something similar, I drilled holes in the side of a 5 gallon bucket near the bottom. Then I put a funnel narrow end up in the bottom of the bucket. 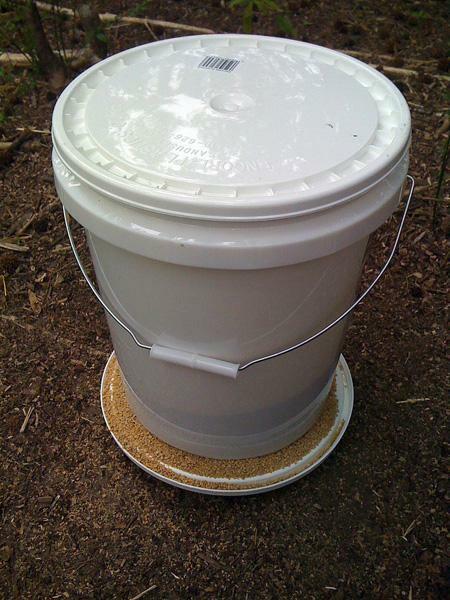 The whole bucket sits on a couple of 2x4's in a galvanized pan which sits on a couple of 4x4's to keep woodchips out of it. I too have to give it a good shake once in a while but not very often. I only feed this way in the winter months and I think it works great. Thank you.......my chicks are 4 months old now,,,,and I will need a larger feeder...love your idea..I think it's great! Great idia,I beleave I will have to try this myself !! I think I'll do this. Thanks!! great idea...thank you for posting!